Findings for the diagnosis of acute DVT on CT venography include an intravascular filling defect of low density or total lack of enhancement of a venous region (Fig. 13) [13,28,29]. Ancillary findings of DVT are enlargement of the thrombosed vein, wall enhancement, and perivenous edema (Fig. 14). With acute occlusive thrombosis, the vein enlarges, sometimes to twice the size of the accompanying artery. The vein wall may enhance to a density equal to or higher than muscle density. An additional finding seen in DVT is a focal perivenous soft-tissue infiltration that is probably due to local edema. This finding, not specific for DVT, is most easily detectable in the thigh and popliteal regions where fat surrounds the veins. Figure 13 Acute DVT. 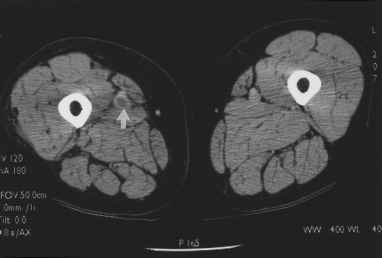 CT venography image of the midthigh shows a clot in the right superficial femoral vein (arrow). The vein is enlarged. Compare with that of a normal left superficial femoral vein. Figure 14 Acute DVT. CT venography image through the knees shows clot in the right popliteal vein. Note expansion of right popliteal vein, the enhanced thick wall (arrow), and the perivenous edema. Figure 15 Chronic DVT. 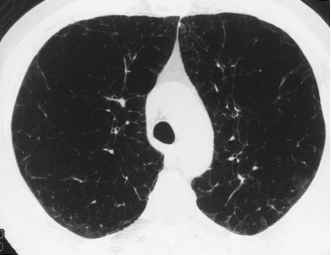 CT venography image in patient with chronic DVT. The right superficial femoral vein (arrowhead) is small; compare with that of the normal left superficial femoral vein. present. Their presence, however, does not rule out acute clot superimposed on chronic clot. Computed tomography venography can define additional disease (e.g., focal venous aneurysm, abdominal tumor, muscle hematoma, bone fractures, and arterial thrombosis) that has an impact on patient management . 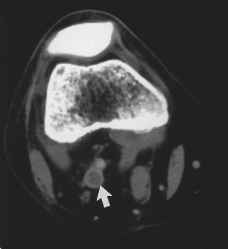 Occasionally, incidental findings that will not necessarily affect patient management are revealed, such as a Baker's cyst, or suprapatellar effusions [28,29].